When we talk about note-taking applications, both in desktop and mobile, Evernote name comes up first. It might be one of the most famous and most fully-featured note-taking application available today. But its current decision to reduce the features for free users and increase the subscription fee for paid users makes it less attractive. 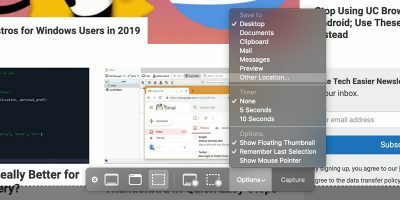 Many existing Evernote users are looking for a viable alternative, and if you are a Mac or iOS user you have Apple Notes as a choice. Notes is free, will sync seamlessly with all of your Apple devices, and is accessible on any device via iCloud web. Notes is not as fully featured as Evernote, but that might be a good thing. It’s light and fast since it’s not bloated. 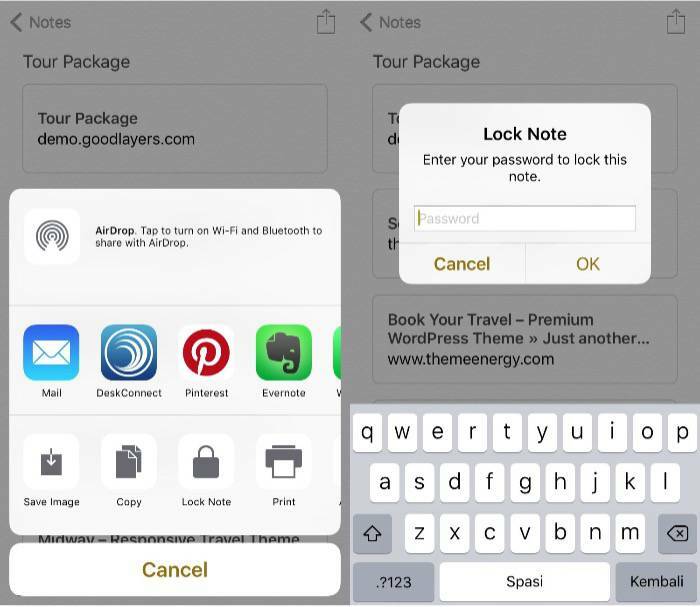 Notes also has one cool feature that Evernote doesn’t have: the ability to protect the notes with a password and Touch ID. 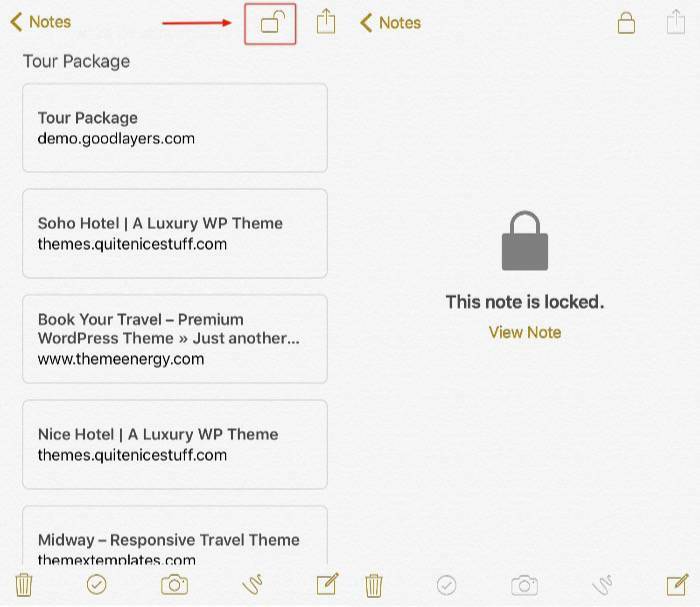 Here’s how you can lock your Apple Notes. 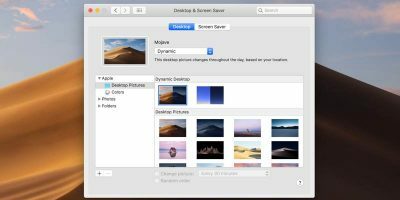 You can set up protection for Notes on your Mac or iOS devices. 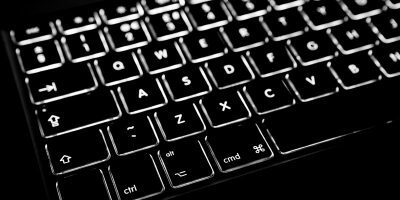 But since the fingerprint sensor and Touch ID feature are only available from iOS devices, the only way to unlock your notes from your Mac is by using the password. 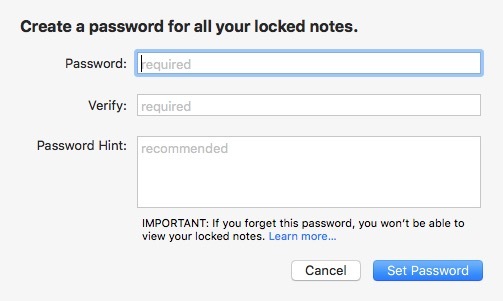 To start protecting your notes from your Mac, open the “Notes” application, and select the note that you want to lock with a password. Then click on the lock icon on the toolbar and choose “Lock This Note” from the pop-up menu. The next step is to create a password for your note. Write down the password twice, and it’s recommended that you include the password hint in the field provided. If you forget your password and don’t have a hint to remember it, you won’t be able to open that note anymore. The next time you try to open the locked note, you’ll get this message. You need your password handy when you want to secure another note, as Notes will ask for it. 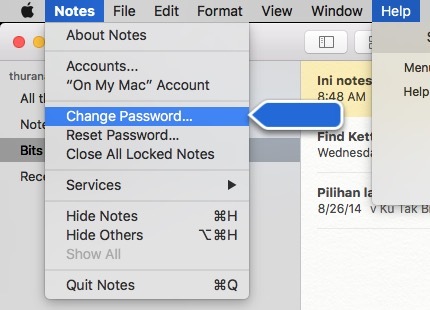 You can change your password by going to the “Notes -> Change Password” menu or remove it entirely using “Notes -> Reset Password” menu. The process is more or less similar with iOS. 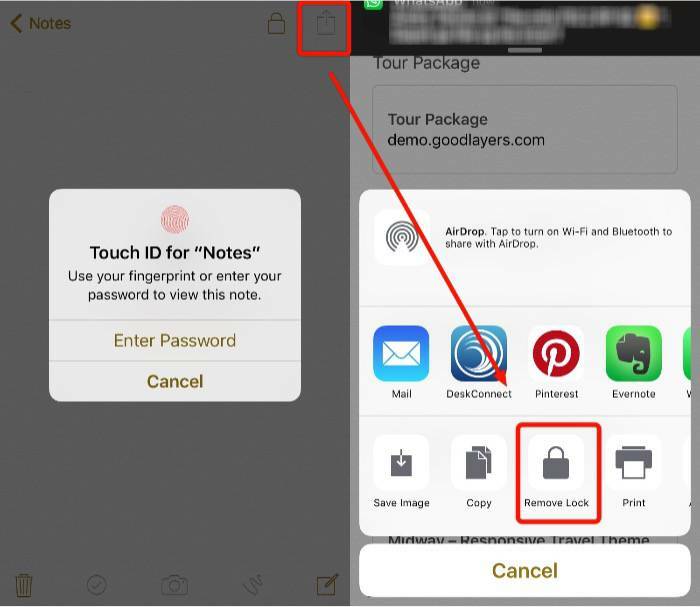 To start protecting your notes with a password, you need to select a note and tap on the “Share” icon on the top-right of the screen (the box with the upward arrow). 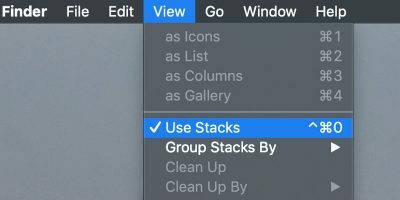 The lock option is sitting right between “Copy” and “Print” on the pop-up menu. If this is the first time you are creating a password-protected note, you’ll be asked to set your password. Otherwise, you’ll only need to use your existing one. Similar to the Mac version, you can also remove the lock if you want to by tapping the share button one more time. But the unique thing that you can only do with the iOS version is unlock the note with your fingerprint using the Touch ID feature. 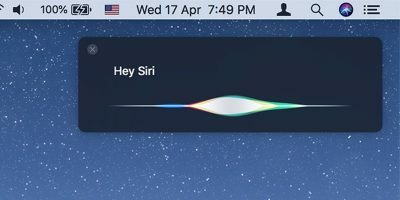 Over the years the Apple Notes app has gotten incremental updates with performance improvements and more features. 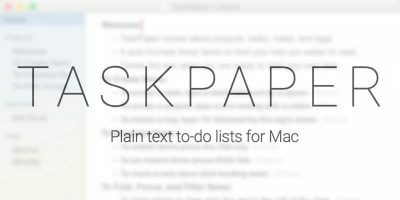 Today’s Notes is a powerful alternative to other note-taking apps. 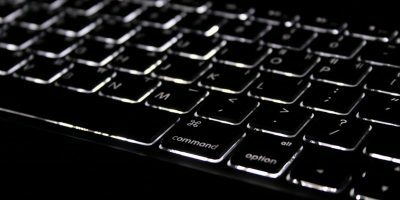 If the rumors are to be trusted, we can expect the next generation of Apple’s desktop computers to have a fingerprint scanner. This means that the Mac version of Notes will also have the Touch ID feature enabled similar to the iOS version. Do you think the security feature of Notes is enough to lure you to switch? Share your opinion using the comments below.